Come On Out And Slay Some Rays! 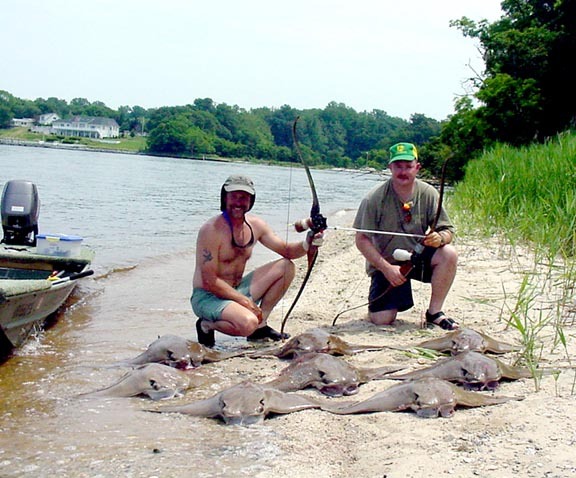 The other day when a friend told me about the Ray Bowfishing Tournament coming up this weekend in the Chesapeake – well, the thought of it seemed barbaric. Bowfishing is just that – using a bow and arrow for the purpose of fishing. But it seems to me that there must be far better ways for people to work off their over-abundance of testosterone. Perhaps the biggest problem is about what we are teaching our kids and the public in general about the value of these animals. Macho killing of “maneater sharks” perpetuates the myth of sharks as mindless killing machines. Hunting for prize money and then discarding the carcasses gives our kids a clear message that killing for fun is not only OK, but it gets rewarded. Not to speak of perpetuating ‘the thrill of the kill’ with catch phrases like, ‘Come on out and slay some rays’. One might say that this methodology makes the fight more fair, than say netting the fish. These hunters point out in their defense that bowfishing kill percentages are low. That just makes me wonder – how many do they leave out there wounded to suffer a slow death? 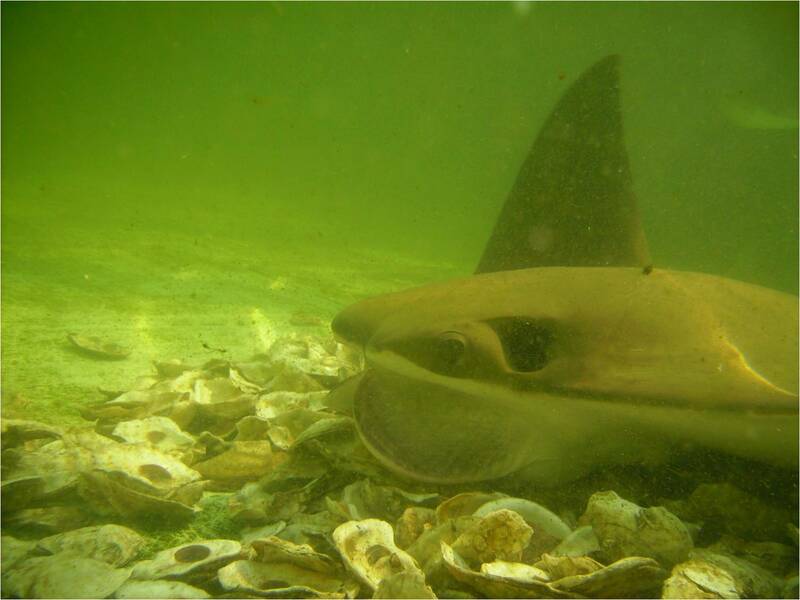 Most of us know about the population explosion of Cownose Rays in the Chesapeake in recent years due primarily to the overfishing of their natural predators, sharks. The consequences of this for the entire ecosystem may be harbingers of what’s to come in future years as overly efficient commercial fishing systems, as well as another unsustainable practices such as sharkfinning cause marine ecosystems to collapse. Between now and October, huge schools of the rays migrate into the Bay and decimate the oyster population, which has dropped to a small percentage of what it was years ago. 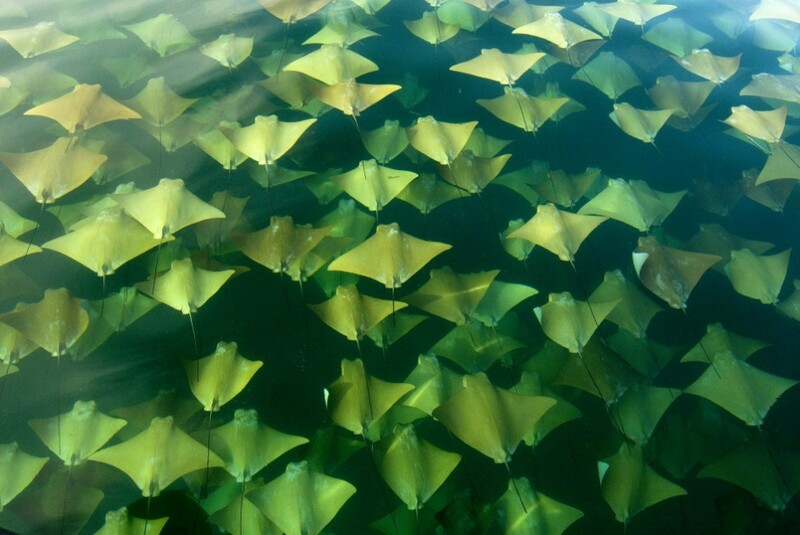 Some say that the schools of rays are so thick that you can walk over them. But now it appears that the rays might have finally attracted the attention of the ultimate predator: humans. The State of Virginia and others are attempting to create a market for the rays as a sustainable fish, hiring high end chefs to create recipes and hosting cooking demonstrations. So far, results have been less than impressive. Some say that a commercial ray harvest could help to restore pollution-filtering oysters, lessen damage to ecologically valuable seagrass beds and create jobs in a shrunken fishing industry. But not so fast. Researchers have found that cownose ray populations are slow growing because they reproduce at low levels. 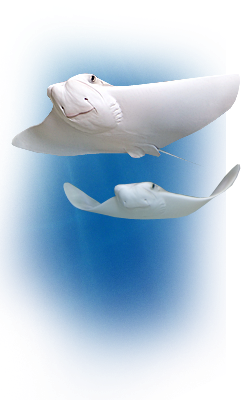 Female rays generally don’t have offspring until they are eight or nine years old and usually only have one pup at a time. But because cownose ray populations grow slowly, decisions need to be made very carefully. Effects from these decisions will last a long time because if populations are reduced too much, they will take a long time to recover. “Currently, there is no reason to assume the cownose ray fishery is sustainable as there are not yet population assessments or limits on catch. After the serious depletion of related Atlantic species (large coastal sharks, spiny dogfish, thorny skates), it is time we learned our lesson and limited shark and ray fisheries before they boom. The public and marketers can help by promoting only seafood that is subject to science-based fishing limits and therefore sustainable over the longterm,” says to Sonja Fordham, President, Shark Advocates International. Rays have long drawn the curses of bay oystermen — who have sought help to rid Chesapeake Bay of them since the 1970s. Recently, rays foiled an oyster restoration effort — eating most of about 750,000 oysters. Organizers had poured an extra layer of shells atop the oyster reef specifically to fend off the rays. “We knew we were going to lose some, but we lost 94 percent in just five days,” said Jim Wesson, oyster expert for the Virginia Marine Resources Commission. As worldwide shark populations continue to plummet, an abundance of rays pose similar problems elsewhere, including off the West Coast and Japan. Pete Peterson, a biologist with the North Carolina Institute of Marine Sciences, said rays gobbled up bay scallops and essentially closed the industry in North Carolina. The benefits of developing a sustainable Chesapeake ray fishery, officials say, would be many: another season of income for watermen, a new product for consumers, and revenue for the state from taxes and permits. Plus, oysters, the master filters of the bay, would have a better chance of survival. My personal belief is that we shouldn’t eat anything that comes out of the ocean right now. But that’s a personal choice. But dare-I-say barbaric practices such as Ray Bowfishing Tournaments are just wrong. What does this teach our kids about stewardship for the creatures that we share our blue planet with? The balance (and understanding what represents that balance) in the Bay shows us that at this time, the Cow nose ray, like lawyers, has no real predators in the Bay due to the small numbers of sharks, like lawyers, and therefore has continued to expand their species, like lawyers….The problem is that the Rays are destroying the natural wild oyster seeds and spat on shell oyster seeds (therefor wasting millions of taxpayer dollars and industry monies),..yes, like layers. One way we can protect the Oyster from the cow nose ray and thereby help accelerate the water quality for the health of our Bay…is to support Oystersforlife.com which provides’ off bottom’ oyster cages to grow oysters and keep them from being eaten by the Ray! Therefore, it solves the short term problem of how to manage the Ray, when it comes to oysters, without having to kill them off. Maybe we should do that with lawyers too…put them in a cage! No..wait, that is one industry we need to “cull out” for our countries health! That’s just our two cents worth…no wait…that is the Food Lion saying!